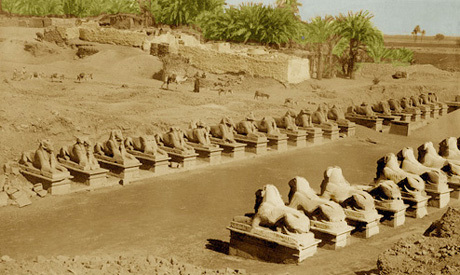 The Avenue of Sphinxes was built during the reign of Pharaoh Nectanebo I of the 30th Dynasty. It replaced another built in the 18th Dynasty by Queen Hatshepsut (1502-1482 BC), as she recorded on the walls of her red chapel in Karnak Temple. According to this record, Hatshepsut built six chapels dedicated to the god Amun-Re on the route of the avenue during her reign, indicating that it had long been a place of religious significance. However, over the span of history the avenue was lost, with some of its sphinxes destroyed and whole stretches buried in sand and build on. I have never visited Egypt. Maybe some day the doors will be open for me to visit the land of the pharaohs. This entry was posted in Archaeology, Egypt and tagged Avenue of Sphinxes, Egypt, Karnak Temple., Pharaoh Nectanebo, Queen Hatshepsut. Bookmark the permalink.